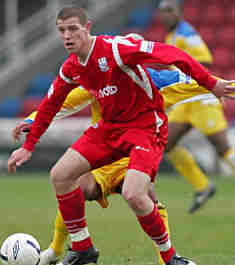 Twenty one year old Glenn Wilson arrived at Aggborough on loan from Rushden & Diamonds until the end of the 2006-07 season. He had joined the Northamptonshire side from Crystal Palace in July 2006 and was a regular in the side until a change of manager put him out of favour. The right sided defender signed for Crawley Town after he left us.